These are the first items I've been privileged enough to design for the wedding of the lovely Celia and Ben. With Celia working in the fashion industry, and Ben as a musician, they are all about doing something unique. I shared some of the design process and original options I created for them to choose from a couple weeks ago. This is where we ended up and they came out pretty amazing! 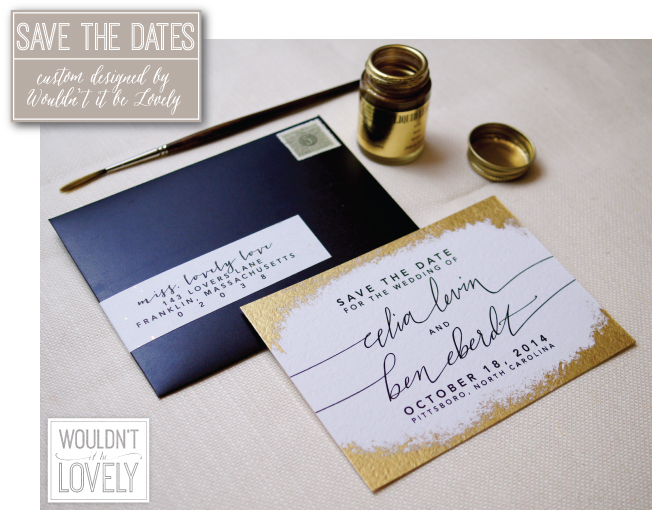 The edges of each Save the Date were hand painted with liquid gold leaf, so they really shine! The rest of the design was simple and clean, I hand wrote their names for more artistic finish, and kept the other fonts in a clean and modern type. Creating this save the date got me even more excited for all the other elements we'll design for their wedding!